Three Blackhawk helicopters from the Tennessee National Guard’s 1-230th Assault Helicopter Battalion arrived in North Carolina late Monday to assist in the relief effort of Hurricane Florence. 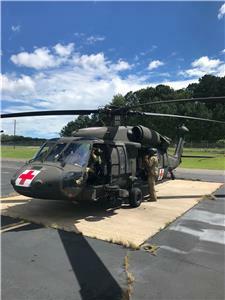 All three aircraft are equipped to conduct medical evacuation with rescue hoist capability, as well as transport medical patients, and supplies to those in remote areas. “Our aircrews are some of the best I’ve had the privilege to work with in my entire Army career,” said Col.